Now former Scioto County Prosecutor Mark Kuhn became county Common Pleas Judge Mark Kuhn after being sworn into office Thursday afternoon. Fourth District Court of Appeals Judge Matthew McFarland did the honors in the very courtroom in which Kuhn will be presiding beginning Monday. Looking on was the new magistrate’s wife Kari Kuhn. Kuhn was nominated for the bench by Gov. John Kasich. County commissioners have four to 45 days after Mark Kuhn formally takes office to name a new interim prosecutor. 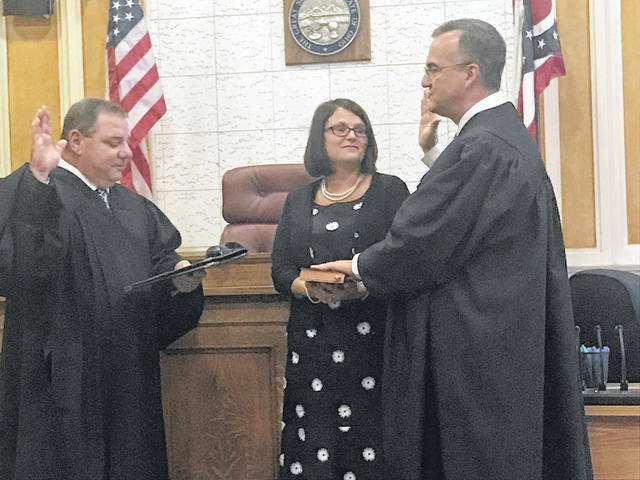 https://www.portsmouth-dailytimes.com/wp-content/uploads/sites/28/2018/07/web1_Kuhn-swearing-in-A.jpgNow former Scioto County Prosecutor Mark Kuhn became county Common Pleas Judge Mark Kuhn after being sworn into office Thursday afternoon. Fourth District Court of Appeals Judge Matthew McFarland did the honors in the very courtroom in which Kuhn will be presiding beginning Monday. Looking on was the new magistrate’s wife Kari Kuhn. Kuhn was nominated for the bench by Gov. John Kasich. County commissioners have four to 45 days after Mark Kuhn formally takes office to name a new interim prosecutor.